"We condemn these activities," Pompeo said, "and call upon Iran to cease immediately all activities relating to ballistic missiles designed to be capable of delivering nuclear weapons." 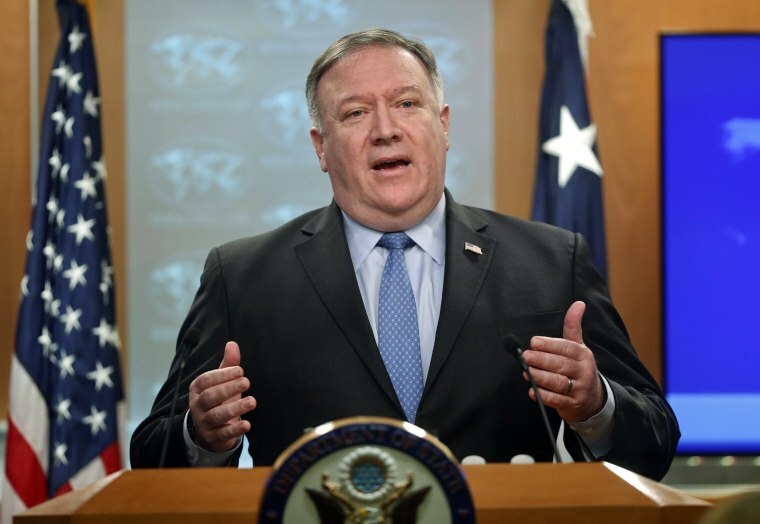 Secretary of State Mike Pompeo said on Saturday that Iran's government had just test-fired a medium-range missile "that is capable of carrying multiple warheads." The ballistic missile Iran tested has the ability to hit parts of Europe and any location in the Middle East, the secretary said, which he claimed would violate a U.N. Security Council resolution that called Iran to not pursue "any activity related to ballistic missiles designed to be capable of delivering nuclear weapons, including launches using such ballistic missile technology." Pompeo reiterated that sentiment on Twitter. On Sunday, a senior Iranian official said the country's missile program was not in breach of U.N. resolutions. "Iran's missile program is defensive in nature... There is no Security Council resolution prohibiting the missile program and missile tests by Iran," state news agency IRNA quoted Foreign Ministry spokesman Bahram Qasemi as saying. The language of the U.N. Security Council Resolution "calls on" rather than "forbids" Iran from testing its missiles, according to Trita Parsi, the president of the National Iranian American Council. The very U.N. resolution that Pompeo cited is also the very nuclear deal the Trump administration withdrew from earlier this year, Parsi added. "We had a functioning deal and you may not have agreed with all the contents of it but it actually contained this conflict," he said. "Trump came in, ripped it up and now we are seeing more missile tests, we’re seeing escalation and we are seeing a drift towards war." Iran agreed to halt the development of its nuclear weapons program and allow international checks of its facilities under the Iran nuclear deal, or the Joint Comprehensive Plan of Action, that the Obama administration negotiated in 2015. In exchange, the U.S. and several other countries fulfilled the landmark achievement by rolling back crippling economic sanctions. Iran had not tested a similar weapon for more than a year, Parsi said, because of that agreement, but that changed after the U.S. withdrew from the nuclear deal. "The Iranians have essentially stopped this testing," Parsi said, "and Trump is now escalating things with sanctions and as a result we are back into conflict." Iran last announced that it had tested a similar missile with a range of about 1,200 miles in September of 2017 and noted that the missile could carry several warheads, according to Reuters. Pompeo reiterated that this latest test confirmed the Trump administration's concerns that the Iranian government had no intention of complying with the nuclear deal. "As we have been warning for some time, Iran's missile testing and missile proliferation is growing," Pompeo said in Saturday's statement. "We are accumulating risk of escalation in the region if we fail to restore deterrence." And though it may have not been in direct violation of the agreement, other experts say it violated the spirit of the deal. "There is a question of good faith here, and I think that's consistent with Pompeo's rhetoric," said former Ambassador Lincoln Bloomfield, who served in the past three Republican administrations, most recently as the assistant secretary of state for political-military affairs under President George W. Bush. Bloomfield said that this missile test appeared to be a statement of defiance from Iran, directly responding to evidence that Brian Hook, special representative for Iran and senior policy adviser to the secretary of state, presented this week that he alleged proved that Iran had violated U.N. resolutions against the proliferation of weapons. Standing near used missile tubes retrieved from multiple locations in the Middle East, Hook said during a news conference at Joint Base Anacostia-Bolling in Washington, D.C., that Iran had greatly expanded its missile capabilities and had shared them with proxy rebel groups in numerous Middle Eastern nations. Bloomfield said that this missile launch may have been in direct response to this display and the Trump administration's harsh words for the Iranian regime. But while Bloomfield said he was fairly confident that Iran would ultimately fold to economic and internal pressure, Parsi said the major concern from this missile launch surrounds what the Trump administration chooses to do. "It is Pompeo’s reaction that is quite a big deal and not the actual missile test itself," he said. Reuters and Abigail Williams contributed.